An undine (also spelled ondine) is an elemental of water and the word itself is derived from the latin root “unda” which means wave. Guardians of the west and ruled by the moon, the undine in the tarot is represented by the suit of cups. Like the ocean they come from, undines can be temperamental and have various emotional extremes from calm to ferocious. I personally resonate with the water element even though I am predominately an air sign. I think this connection comes from my father’s influence as I spent lots of time near or in the ocean growing up. My father was a deep sea diver, captained various vessels and was an avid fisherman who also served in the navy. He taught me how to swim when I was 4 (by throwing me off a pier) and a few years later I reached the highest levels in my swim/dive class at school due to my fearless confidence. Even after a close call with a shark (which could of taken my left hand) when I was 6 and nearly drowsing (due to a rip when I was deep sea swimming) when I was 16, nothing has put off my obsession with the ocean. I have always felt like I was being taken care of and protected by the elementals of water and developed a fascination with mermaids and later on sirens. 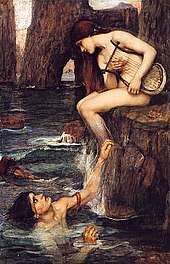 I have had a thing for Sirens ever since I first visited my maternal grandmother’s home island of Lemnos and learned about their mythology from the Ancient Greek point of view. There was more to their myth than trying to lure Odysseus and his crewmen with their song to their watery deaths by crashing their vessel against the rocky shoreline. They were known to have beautiful voices which lured people (predominately male mariners) into the depths of the sea where they resided. However some of the locals I spoke to during my last trip to Lemnos insist it wasnt the sirens voices but the words they used which was so poetically entrancing that it would seduce anyone anywhere. In Lemnos at a place near my grandmothers home was a place called Kaviria (where the kavirian mysteries took place) and where according to local folklore legend, the Sirens reside. 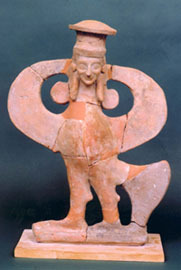 The siren is known as the handmaidens of Persephone and are part bird and part woman. When Persephone was was taken by Hades, Demeter gave the sirens wings to search for her. Demeter then cursed the sirens for not assisting when they witnessed Persephone’s abduction by Hades. Muse of the underworld, the siren was considered a very powerful creature whose image was used as a protective totem by the locals of Lemnos. Where my grandmother’s house is located near the Kaviria in Lemnos (far east of the island) they have found many images of the siren buried under homes as a protection charm (see image below). terrarium for a friend with succulents: black prince, violet queen and zebra plants. 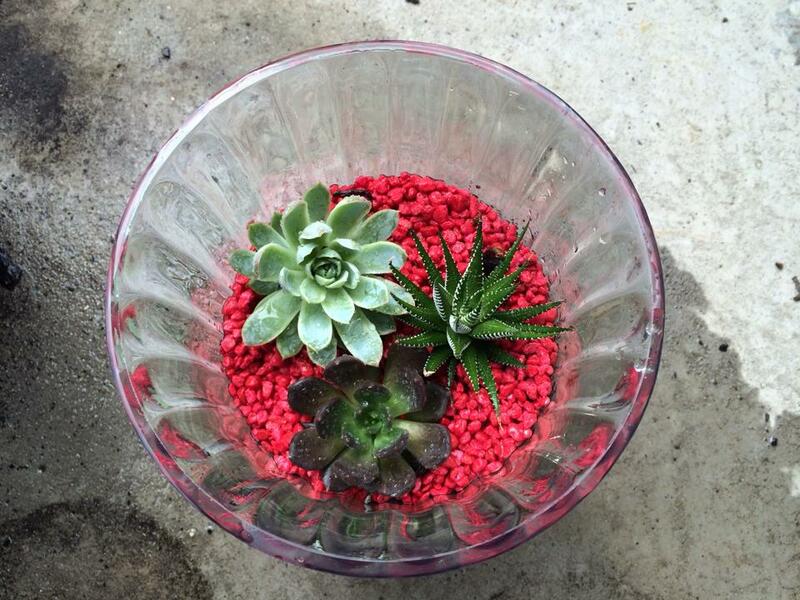 A Terrarium is a miniature indoor garden contained within a clear container. And have been around since the mid 1800’s. Ensure you thoroughly wash and dry the glass container (and cover if used) you will be using for your terrarium. Place a layer of the gravel/pebbles on the bottom of the container which is done to ensure adequate draining occurs when the plants are watered. Place a layer of sphagnum or sheet moss to stop potting mix from trickling through to the bottom of the glass container. Place a layer of potting mix which is damp on top of the moss. Arrange the plants within the potting mix in a visually pleasing manner. Arrange a thin layer of gravel/pebbles on the top to ensure the plants and potting mix is stable. Place any accessories you like such as rocks, shells, small statues as decorations on the top. 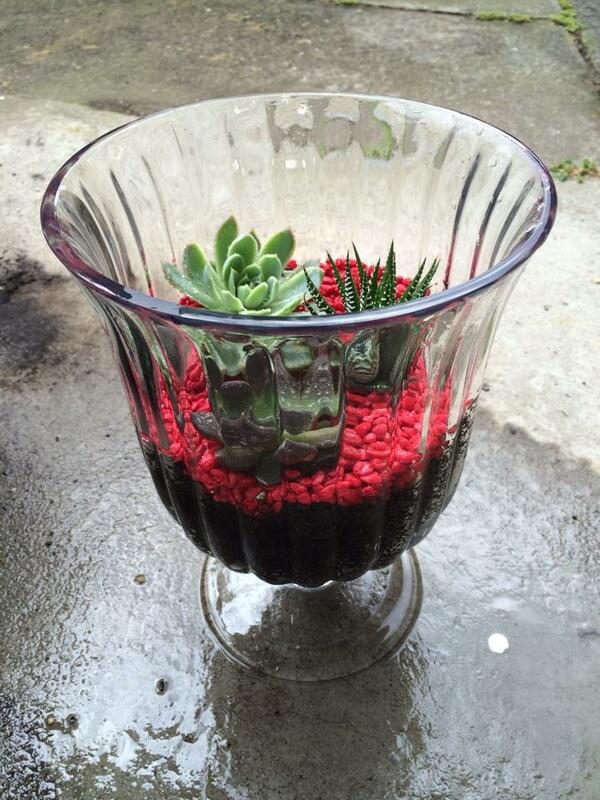 Place terrarium in the home/office/business within indirect sunlight. Turning the terrarium every so often ensures the plants grow evenly. Prune periodically ensuring all the dead leaves are removed and the height and width of plants remain at optimum level so they don’t overcrowd the container. Water weekly. I suggest a spray bottle used over the plants to ensure they aren’t over watered. If you are using a lid on your container ensure the plants are completely dry after you have watered them before replacing the lid. Fertilise with a small amount of water soluble fertiliser once a year (spring is the best). Is a great home warming gift or can be placed in the office as a detoxing plant. She looked at her hands – flesh blistering and bleeding. The raw pain she felt made her eyes sting, causing salty tears to streak down her face. A muffled whimpering was echoing off the walls of her deep cell. She soon realised it was coming from her. “I will never confess.” She half whispered to herself, as she gathered the strength to steadily pick herself up. She shuffled across the filthy floor, jingling the chains which bound her feet. A foreboding feeling came over her, as she made her way to the barred window which overlooked the town square. Shafts of light touch touched her vacuous face as she viewed the spectacle unfolding before her. The townspeople gathered in the square. Peddlers set up stalls selling sweet bread and ale, while others set up viewing stands in front of the pyre. She raised her hand and gently touched her carelessly shaven head. The raven hair was no more. Her body repulsed at the thoughts of those men touching her. She wore her pain like a mask, but those emerald eyes still remained her most alluring feature. To this grand beauty they had put flames to the soles of her feet and palms of her hands. On the rack they had stretched her like toffee and whipped her naked back until it bled. Her thoughts were interrupted with the loud creaking sound of the cell door being unbolted and opened by the guards. In walked Father Toulouse carrying a well worn copy of the Malleus Maleficarum – the inquisitors bible – under one arm. In the other he carried a small black leather bag, much like the Parisian doctors carry. “Bring me a small table and a stool.” he snapped at one of the guards, while narrowing his eyes in the direction of the woman. “Confess to what?” she answered. “What are you trying to say, Father?” she said teasingly. “That you’re a witch!” he shouted, the last word echoing off the damp walls. She began to laugh madly, her voice ringing out and scraping the cell. With a sudden burst of anger Verity leapt forward and stood stock still, two feet from him, her eyes piercing his like a needle. “Curb your tongue witch. You will be thrust down into the eternal fires of hell soon enough. Many have witnessed your bewitching powers. We have signed documentation stating you practice the Black Arts. This alone can send you to your death, for heresy is against God’s law. The cell door creaked open once again and the guard brought in the table and stool. “Place them in the middle of the room.” ordered Father Toulouse. Verity backed away and wrapped her arms around herself in a protective manner. Father Toulouse proceeded to empty the contents of his bag onto the table. He took out a box of matches, a yellow candle, a candle holder engraved with tiny dancing angels, a small brass bell and a Bible. His trembling hands lit the candle and placed it in the candle holder. He picked up the copy of the Malleus Maleficarum turned to a marked page and began to read out loud. With that he closed the book, rang the bell once and extinguished the candle by thrusting it down onto the ground. A short time after Father Toulouse had made his exit, some women from the village had come to her. They had bathed her in wintry water scented with frankincense and dressed her in an unsullied white robe which reached down to her toes. All the while Verity thought of her impeding fate. She knew she was being prepared like wild pig for feasting. Verity didn’t fear death – that had never bothered her. Leaving her kindred – that had never bothered her either, as she knew they would see each other again – if not in this life, in the next. What bothered her was the exhibition she was being made into. People had obviously come to see the burning of a witch – no matter if the accused was innocent or guilty. It grieved her to think of her family watching as they set her alight. Her body twisting and thrashing about with extreme agony. Afterwards the chosen ones would gather her ashes and cast them to the four winds, not enabling her to have a final resting place. “Here take this and carry it in front of you while you make your way towards the pyre.” said one of the women. Verity let her thoughts return from the scene playing in her mind and looked at what the woman held before her. It was a white, six pound candle. “Is this supposed to invite death?” Verity said mockingly. “You’re a marked woman now,” said the woman, as she gestured Verity to follow. She was led out of her confining cell and up some squalid stairs until they reached the oak door. This door connected the prison cells to the church anteroom. Verity was then taken out of the dismal looking church and into the beaming light of day. Many had gathered. The town square was full of people pushing and elbowing each other to get a good view. “Make your way to the pyre.” Another faceless woman said, as Verity was given a shove. Verity swallowed her anguish. With her hands outstretched bearing the candle she gradually made her way to the foot of the pyre. The crowd oohed and ahhed as she passed. A few actually called out to her, protesting she confess to her guilt. Father Toulouse appeared out of the dense crowd and took a place by her side. He nervously unrolled a piece of parchment he was holding and cleared his throat. “I Father Michael Toulouse by the mercy of God of the Roman Catholic Church, seeing that you Verity Lore, of Arras in the province of Southern France, has been accused before us of such heresy as worshiping Satan and committing such crimes as taking another’s life, manipulating elemental force, shape shifting, the conjuring of spirits, sorcery with intent to harm and bewitching people to do your will. Wishing to make sure the charges made against you are true and whether you walk in darkness or light, I proceeded to inform myself by diligently examining the witnesses and questioning you, and by proceeding in every way I was bound by the canonical decrees. Wishing to conclude your trial in a manner beyond doubt, I have diligently examined each circumstance and the material provided in the present case and I find you Verity Lore have been legally convicted of having been infected with the sin of heresy for so long a time, that you have said and committed crimes against the Holy Church, and are therefore legitimately convicted of the said heresy. The Church of God has waited for you to repent and acknowledge your guilt, and you have refused and still refuse, so the Church’s grace and mercy can go no further. Therefore you must be an example to others and that they may be keep from all such heresies and that such crimes may not remain unpunished. A sudden wave of shouts arose from the crowd, declaring their consent. Verity scanned the crowd for familiar faces. None – all had abandoned her. “I wish to speak!” she cried out. “She wishes to confess,” one shouted. “She wants to beg for forgiveness,” yelled another. “Hear me out! Let me speak!” she screamed over the crowd. “Very well,” said Father Toulouse turning towards Verity. Verity thought silently for a moment. She put the candle down on the cobbled stones and faced the crowd. She raised her arms pleadingly and took a deep breath. A loud mumbling escaped from the crowd. “Father”, she said turning her attention to Father Toulouse. In the blink of an eye Verity ran up the pyre steps, grabbed the flint torch from the black hooded executioner and set the pyre alight. She discarded the torch and thrust herself into the flames. Screams erupted from the crowd as people ran in all directions pushing and shoving to get away. Father Toulouse was so shaken he clasped his hands in prayer as he fell to the ground. Meanwhile Verity twisted and convulsed as the flames enveloped her. She let out a piercing cry…and then there was blackness. In the distance a voice could be heard. “Christine, Christine can you hear me? Christine, when I count to three you will travel back to the present time. You will open your eyes and find yourself in the safe and comfortable surroundings of my lounge room. You will remember what you have seen but you will not bring back any pain from that time. “The end is the beginning and the beginning is the end.” Christine half whispered to herself. I would like to dedicate this story to the men, women and children whose innocent lives were taken during several inquisitions from 1231 – 1860. During these centuries of injustice many innocent people were persecuted for acts they did not commit. To our fallen brothers and sisters their memory lives on – for they live inside us. 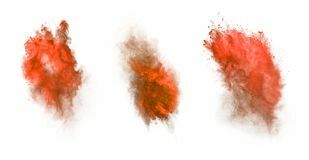 Red Brick Dust aka Brick Dust, Red Dust, Reddening or Red Power is a powder which is used in African centric and folk magick traditions. The use of it originates from red ochre which was used by various ancestral traditions. Red Brick Dust is used for protection (especially of one’s home or business), hex breaking as well as being used to colour bones or runes used in spirit, animal or ancestor veneration. Place the brick in the pillow case and twist the end and hold down on the ground firmly whilst you use the other hand to pummel the brick into dust. Sprinkle across doorways, windows and around property for blessed protection at dawn in a clockwise/deosil motion. Will also counteract hexing powders which have been laid upon you by simply sprinkling the Red Brick Dust on top of them.